"custom design", "custom display", "exhibit staging", "exhibit", "Microsoft Canada", "custom booth", "Future Shop"
It has been great to see all the tradeshow and training elements come together for the Connected Homes Summit in Niagara Falls this week. 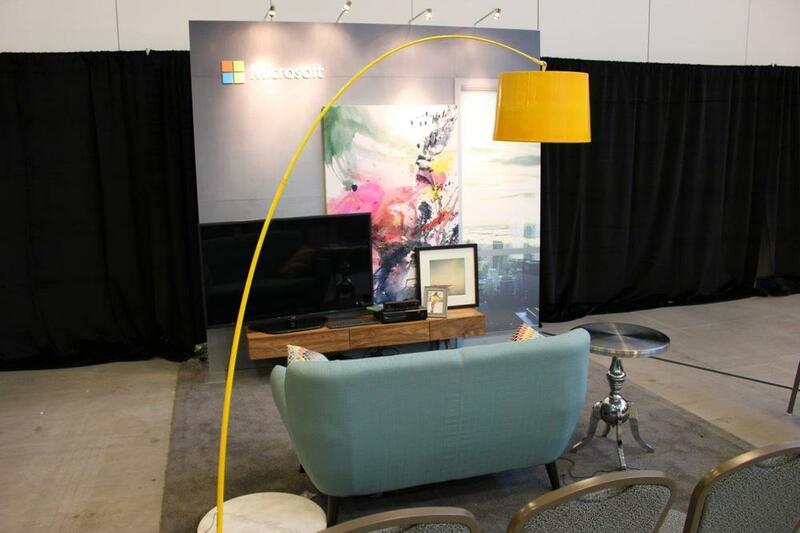 Our designers, carpenters, crews and graphic production staff have been working on new pieces for the Microsoft Canada team and it was great to finally see some live photos from the convention centre today. "booth", "custom design", "custom booth", "custom display", "design", "exhibit design", "exhibit staging", "home staging", "home styling", "Microsoft", "Microsoft Canada"
Microsoft and Lenovo Canada are showcasing their products at the Staples Back2School event today. It is all about the experience: Trainers showcased the devices in a library, living room, bedroom, cafe, office and lecture hall. The exhibit spaces are based on 10' x 10' footprints. The interior design & staging for these themed environments was focused on showcasing their devices being used in the real world. The printed backgrounds are not photographs, they are 3D environments we created, rendered in Cinema 4D & VRay, and printed specifically for these displays. A sneak peek of the new booth Microsoft Canada is taking to the Staples Back 2 School event in Markham tomorrow. It's hard not to love what we do!